Should You Prescribe Neuroenhancement Drugs to Your Patients? The total monthly prescriptions for neuroenchancement drugs for attention deficit-hyperactivity disorder (AHDH) in people 18 years old and older have been steadily increasing over the past few years — 3.2 million such prescriptions were recorded between November 2006 and October 2007. Indeed, 20 percent of the respondents to a 2008 survey by Nature of its readers admitted to using neurocognitive-enhancing drugs, mostly to improve concentration. 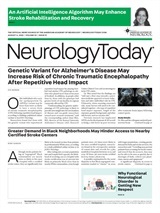 In response to this mounting trend, the AAN Ethics, Law and Humanities Committee published a guideline in the Oct. 27 Neurology to provide neurologists with an overview of the ethical, legal, and social issues surrounding neuroenhancement, as well as to serve as a practical reference for neurologists responding to an adult patient's request for medication. Orly Avitzur, MD, chair of the AAN Practice Management and Technology Subcommittee, a regular contributing writer for Neurology Today, and the editor-in-chief of AAN.com, asked two current members of the AAN Ethics, Law and Humanities Committee — James Gordon, MD, clinical associate professor of neurology at the University of Washington, and Matthew Rizzo, MD, professor of neurology, engineering and public policy at the University of Iowa — to discuss their views of the neurologist's role in handling patient requests for medications to enhance or augment normal cognitive or affective functioning — using a common scenario to frame the discussion. Q: A 45 year old essentially healthy university physics professor feels as though he slowing down because he is not publishing as many papers as he used and requests a medication to help him “focus.” He is currently taking a beta blocker for essential tremor and an anticholinergic drug for irritable bowel syndrome. DR. JAMES GORDON: A request for neuroenhancement should be viewed as a chief complaint. Accordingly, loss of function is a symptom that mandates, at a minimum, assessment for and treatment of conditions that might be causing the problem: dementia, brain tumor, hydrocephalus, depression, alcoholism or drug abuse, and confounding medications. If no such condition is present, it would be tempting to dismiss a high-functioning person's complaint that he's having trouble keeping up as he gets older, but as physicians, we are obligated to do our best to relieve suffering. Self-perceived loss of function engendering enough distress to prompt a request for medical treatment must be taken seriously. If no causative illness exists, the physician's obligation is to do his best to relieve the suffering, itself. “Live with it!” is never an acceptable response. A physician has no obligation to provide treatment that is not medically indicated. Medical indication, in turn, depends on the identification of a disorder and on the existence of a treatment sufficiently safe and effective to counterbalance any risks that such treatment might entail. When function is lost in the absence of underlying disease, consequent distress, itself, may become the disorder. Antidepressants or anxiolytics might be appropriate in some such cases. But if it is permissible or even standard practice to prescribe antidepressants for severe distress triggered by loss of function in the absence of diagnosable disease, it is no less permissible — and perhaps even more compelling — to prescribe safe and effective medication that might restore or improve the function whose loss caused the distress in the first place. If safe, effective restorative treatment exists, providing so-called enhancing medication to “help him focus” is no less legitimate a therapeutic strategy than referring him for cognitive therapy, offering grief counseling, or prescribing an antidepressant. DR. MATTHEW RIZZO: I agree with Dr. Gordon that people should be allowed to choose what they put into their own bodies, as long as they understand the potential consequences. People have long sought to enhance their mental processes using stimulants such as coca for performance and hallucinogens for spiritual insight. Nowadays, a certain level of cognitive enhancement seems to be acceptable, as demonstrated by the ubiquitous use of caffeinated beverages, or the use of beta-blockers for “stage fright,” for example. Suppose our physicist has cognitive test scores within broad expectations of normal and no abnormalities on other tests such as EEG or brain MRI and PET. In this case, we might apprise him of the favorable test results, discuss the potential role his anticholinergic medication or beta blocker may be playing in his complaints (including a possible trial off the medication), and follow him in clinic to reassess. What if we found a biomarker that suggests the patient is at somewhat increased risk for developing a disease in the future? New screening procedures and treatments might delay or prevent dementia onset in persons with preclinical Alzheimer disease or mild cognitive impairment. Conversely side-effects of a pre-emptive intervention may exceed benefits in a person who might never develop dementia, thus creating unacceptable risks both for doctor and patient. Such uncertainties serve to underscore concerns about the validity of medical predictions and implications of premature treatment. The question of who —doctor, patient, regulatory bodies, third-party payers — should have a role in defining an “acceptable” risk-benefit ratio in a given situation is a critical aspect of the ethics of neuroenhancement. There are clear precedents outside the field of neurology for treating individuals without recognized “medical” illness, for example, in prescribing antibiotics for people without bacterial infections, growth hormones for short stature, anabolic steroids for strength, and administering cosmetic enhancements such as botulinum toxin injections for harmless wrinkles. Yet, neurological enhancement requires more careful consideration, since CNS drugs may alter a person's personality, mood, decision-making and self-awareness, potentially reduce a person's ability to make decisions on his or her own behalf, and increase the risk of manipulation by others. We should also not discount the effects of stress in our physicist. He may be in a “publish or perish” situation, seeking evaporating research funds, coping with difficult teenagers, or experiencing a host of dilemmas that can cause pain and distress in us all without amounting to a definable disease. Mind-brain-body interactions affect health outcomes and depend on a patient's attitudes, emotional traits, self-perception, situational awareness, and reactions to environmental stress. Mental stress may contribute to a host of physical disorders including increased gastric acid secretion, which can lead to ulcers, irritable bowel syndrome, menstrual cycle disorders, erectile dysfunction, cardiac disease, fatigue, dysphoria, pain, and other somatic complaints. Depression, anxiety, and other psychological disorders, as well as sleep disorders such as obstructive sleep apnea and insomnia can all reduce cognitive performance. When do such conditions serve as an indication for a cognitive activator? A patient's right and responsibility to assess risks and benefits for him- or herself represent just one aspect of decisions to treat. Ideally, controlled clinical trials and Class I evidence (demonstrating safety and efficacy of drugs for a given indication, as well as the effects of chronic use) should be used to inform treatment choices physicians offer to their patients. At the present time, there is a paucity of data concerning the safety and efficacy of neuroenhancement medications in a normal population. Physicians who are considering prescribing these medications should bear this in mind when confronted with a request for neuroenhancement. Treat the request as a chief complaint. Perform a history and physical examination and work-up as appropriate to rule out organic disease. If there is no organic disease, take it as a signal that you are prescribing neuroenhancement. Understand it is ethically and legally permissible to refuse to prescribe neuroenhancement. If you do prescribe a neuroenhancement, apply the principles of informed consent. Set realistic expectations and establish goals for outcomes. Understand that discontinuing a neuroenhancement prescription is ethically and legally permissible. Are you looking for advice or direction in handling a tough ethical quandary or challenge in your neurology practice? Members of the AAN Ethics, Law and Humanities Committee are available to answer your questions. Submit your questions and ideas for topics to neurotoday@LWWNY.com. • Larriviere D, Williams MA, Rizzo M, Bonnie RJ, on behalf of the AAN Ethics, Law and Humanities Committee. Responding to requests from adult patients for neuroenhancements: Guidance of the Ethics, Law and Humanities Committee. Neurology 2009; 73:1406–1412. E-pub 2009 Sept. 23. Neurology Today9(22):12-14, November 19, 2009. The Ethics of Neuroenhancement: Where Should the Line Be Drawn?